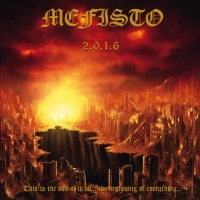 It’s been a really long time coming, the first full-length album from Swedish death metal band MEFISTO, is finally here, after what seems like an impossibly long time. They have released demos going back to 1986 and a couple of compilations in 1999, and then again in 2014, but this is the first time we get to hear a proper full-length studio recording. The real question is, did all that time pay off? 2.0.1.6 is not, by any means, a bad album; in fact it’s actually quite good. The issue is that the wait has been so long and it truly feels like if this album were to be released in say, 1990-1995, it would have attained a certain cult status that it possibly deserves. This is extremely rough and angry death metal, which really is as it should be. It’s often much slower paced than a lot of what is offered in the genre, often leaning toward doom metal and at times has the haunting darkness that you would expect to hear in black metal. It borrows bits and pieces from a few different genres, which actually works quite well for Thord and company. The vocals are loud, powerful, and exactly as ugly as they should be and often seem to take precedence over the instruments. The recording and production of the album is suitably rough and imperfect, which further adds to the dirty old school fell of the entire album. Neither of these points are to be taken as bad things, as it truly is what is best for this album. The first few songs like “Deathrace”, and “Void” didn’t particularly grab me, but moving along a bit further “Heads in the Sand” was a truly stellar track. “The Puzzle” stood out, however, and it just made me wish that the entire album was as expertly crafted and incredibly dark as this song is. It closed on a strong not with the title track “2.0.1.6”, and although I didn’t think I would, I instantly wanted to go back through and listen to the majority of this album again. There are times where you hear the true skill of these musicians coming through, and it’s at those moments that you really start to appreciate what you are hearing. They have put a lot of time and effort in to this, and for the most part, it does show in the crafting of the songs. So while there were a few relatively weak links in the chain, overall, “2.0.1.6” was a very good album. Just not amazing, and possibly came a little too late. Still I would recommend you give this a go, especially if you are a fan of early death metal.